Pho & Rice opened up in August 2013 in the former Winds of Change-Game Exchange-Record Exchange space next to Grum’s. It has been serving up pho to the masses ever since. 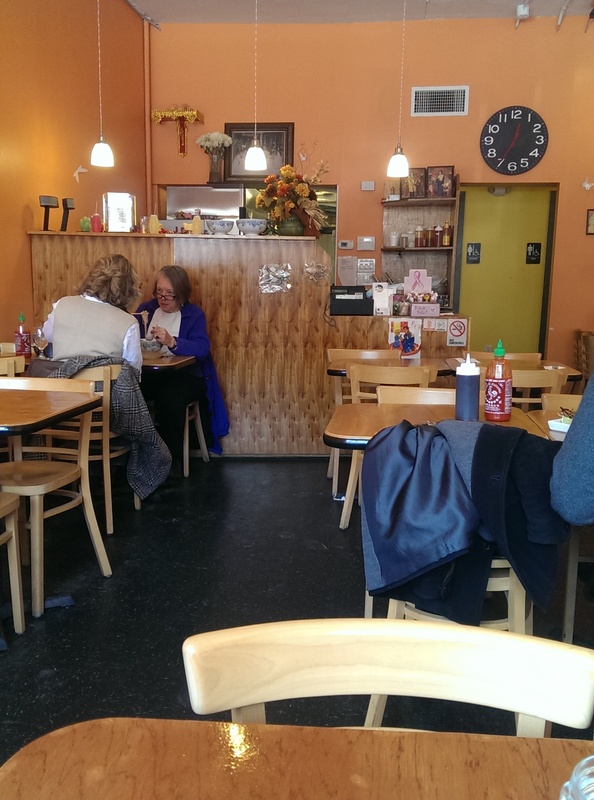 It serves Vietnamese and some Thai dishes as well as bubble tea and Vietnamese iced coffee and tea. 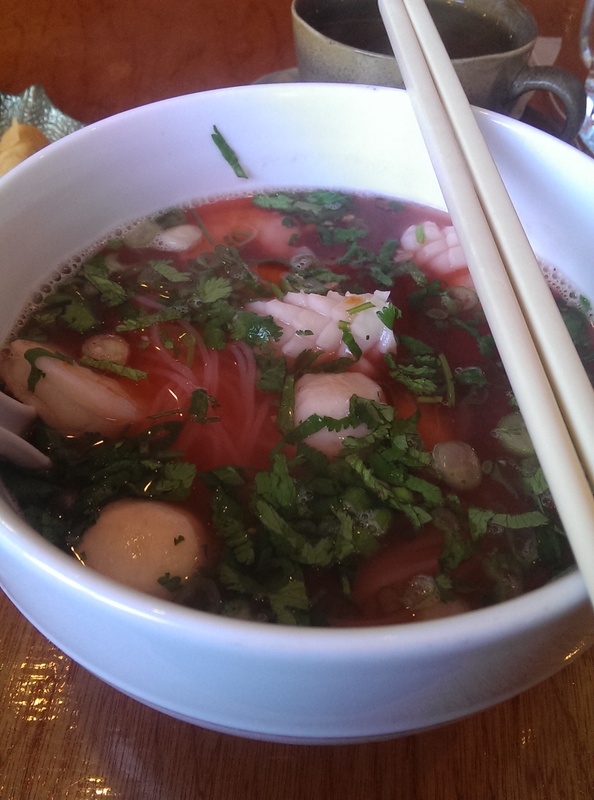 There are a dozen phos, both small ($8.95) and large ($9.95), with the usual noodle, beef, chicken, shrimp and seafood add-ins. The broth is made in house. The pho is not as good as Superior Pho, but it is a decent pho and conveniently located at the intersection of Coventry and Mayfield. 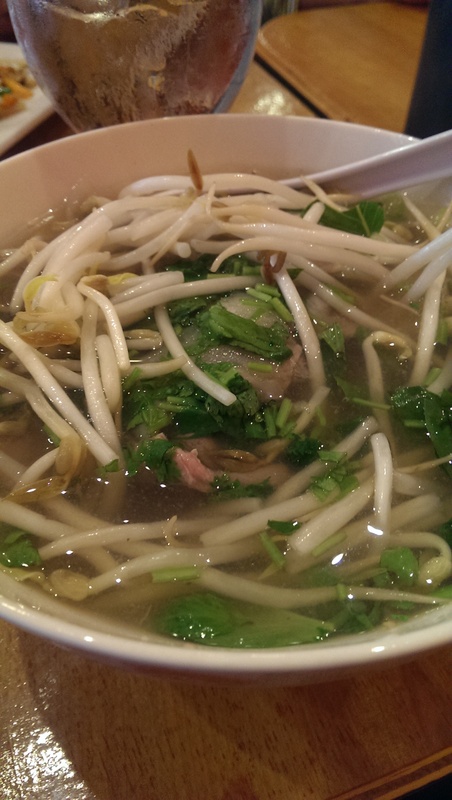 The pho is served with a good sized portion of bean sprouts, some Thai basil, a few jalapenos, and a lime wedge. 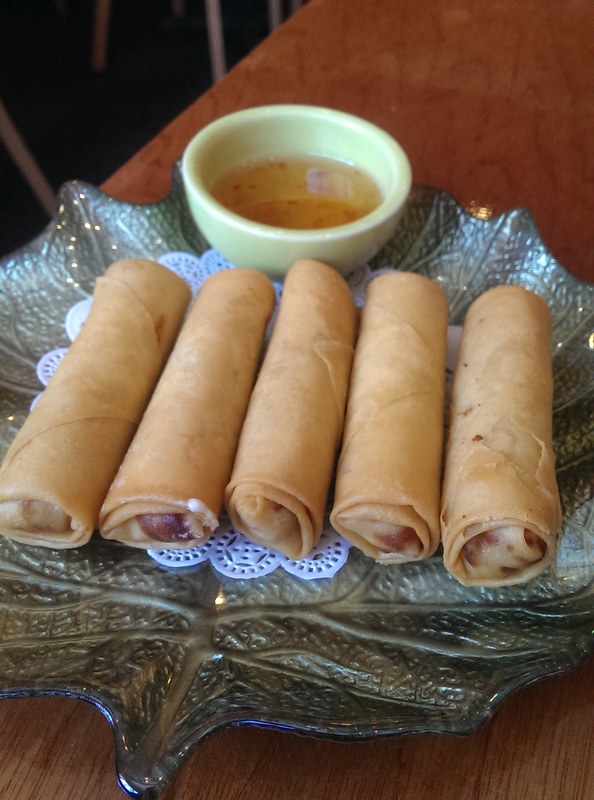 The Crispy Roll appetizer features 5 small, tightly wrapped vegetable spring rolls and a sweet chili dipping sauce. I ordered it expecting one roll, but it was a nice surprise to have 5. I brought several home with me. They came out of the kitchen piping hot, so I was glad I had been given some water. They left a small sheen of grease on the doily but not enough to make my fingers too greasy. The flavor was good. The first time I ate there I ordered my usual bahn mi and beef pho order. First of all, the bahn mi is listed under Salads as “Vietnamese Sandwich Salad.” It isn’t a salad at all, but when I ordered it I thought it might have been a deconstructed bahn mi as a salad, which I would have been okay with. 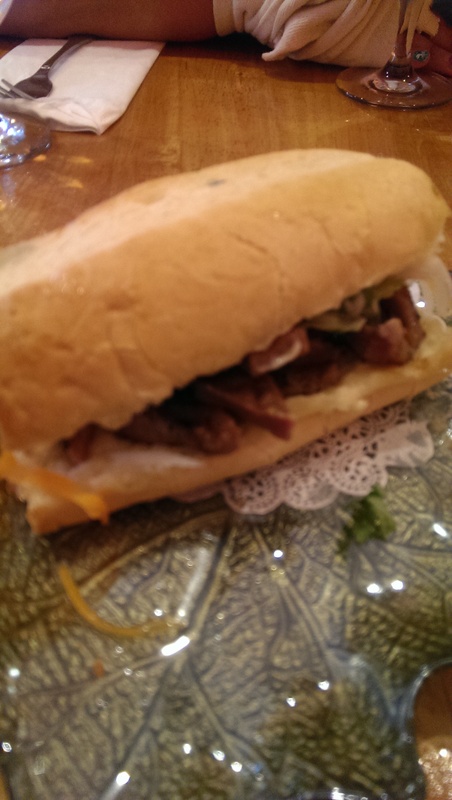 The bahn mi was your basic bahn mi with roasted pork, cucumber, carrot, cilantro, and jalapeno, but had a sweet cream mayonnaise. It was quite good, and I particularly liked the pickled vegetables. They did not overwhelm the pork. The sandwich came out warm, the bread was crispy but not dry, and the sweet cream mayonnaise sauce was a nice addition to the pork and vegetables. My vegetarian friend was thrilled to hear that the bahn mi is available in a vegetarian version and has since made it a regular stop for dine-in and carry-out. The beef pho hit the spot. The beef was not overly cooked, and the rice noodles were the perfect texture. The broth was well-seasoned, if a little sweet. The bean sprouts, basil, jalapenos, and lime were fresh. A squirt of sriracha stirred in made it perfect. I like the idea of having pho within walking distance. My friends ordered the Drunken Noodles with tofu and the Pad Thai with shrimp and liked them a lot. 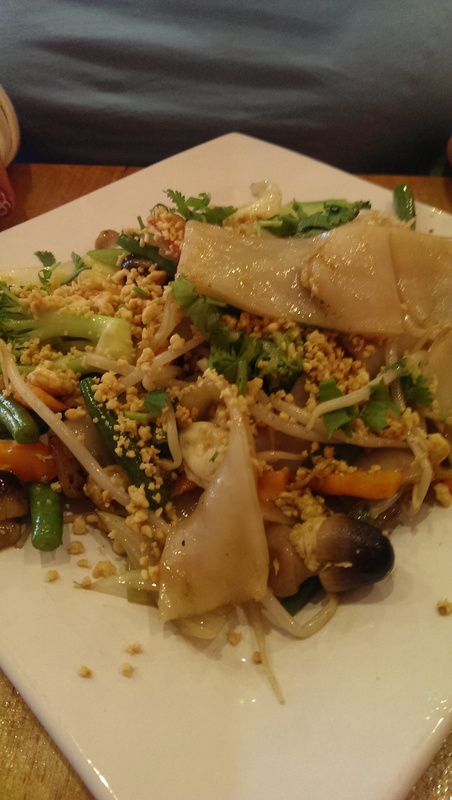 The drunken noodles were indeed delicious and very flavorful. I had several bites from my friend’s order because I loved them so much. She went back and ordered it again a few days later. 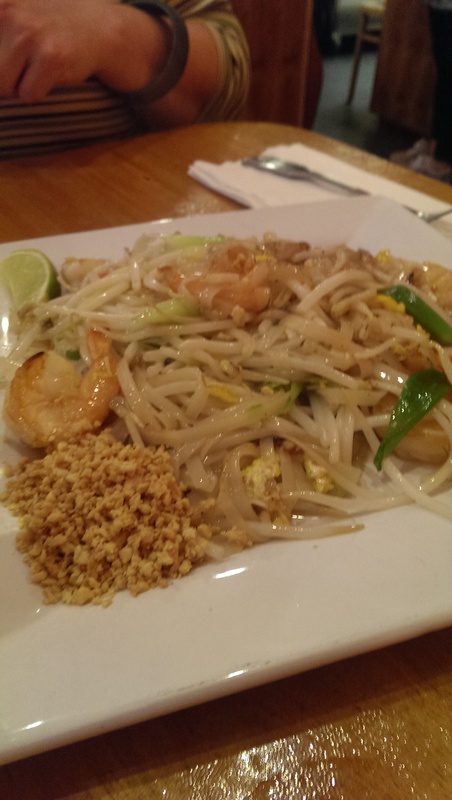 The Pad Thai was a bit deconstructed, but once my friend mixed it all up she was a very happy camper. I can’t say I tried it, but it looked fresh and the shrimp did not smell fishy to my nose. If given the choice I would probably go to High Thai’d for their country pad thai, but if you are out with friends who want pho and are in the mood for pad thai this isn’t a bad choice. I was in the mood for pho again recently, but didn’t want beef pho. 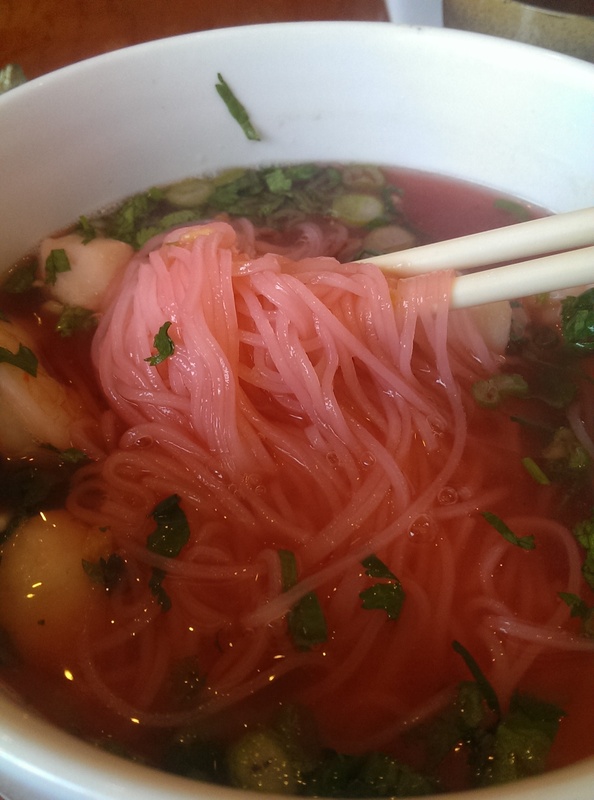 I was toying between the chicken pho and shrimp pho when the Pink Noodle Soup caught my eye. At $10.95 it is only available as a large, but I didn’t have any trouble finishing it. In addition to pink noodles, it came with two shrimp, two mussels, two squid and two fish balls. It has a different flavor and was a little fishier than I expected, but once I added sriracha it hit the spot and made me perspire, which is the sign of a good soup. The Thai Tea bubble tea was really delicious. I have never seen Thai Tea bubble tea on other menus. You usually just see fruit flavors or flavors like taro. They are on the menu too, but you can also order Thai Tea, Thai Coffee, Mocha or Black Milk Tea here. If you like bubble tea you should definitely give them a try. If you value loose leaf tea don’t bother ordering hot tea here. It is served as a tea bag in a tea cup. The place is tiny, but the servers are friendly and welcoming. With big windows overlooking Coventry it is bright and cheerful, but there is a draft in the winter.